The worker who is always engaged in work against the injunctions of the scripture, who is materialistic, obstinate, cheating and expert in insulting others, and who is lazy, always morose and procrastinating is said to be a worker in the mode of ignorance. In the scriptural injunctions we find what sort of work should be performed and what sort of work should not be performed. Those who do not care for those injunctions engage in work not to be done, and such persons are generally materialistic. They work according to the modes of nature, not according to the injunctions of the scripture. Such workers are not very gentle, and generally they are always cunning and expert in insulting others. They are very lazy; even though they have some duty, they do not do it properly, and they put it aside to be done later on. Therefore they appear to be morose. They procrastinate; anything which can be done in an hour they drag on for years. Such workers are situated in the mode of ignorance. 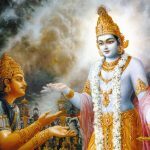 One who does what should not be done is ayuktah. One who acts according his nature, so that whatever occurs in his mind he does rather than according to the instruction of the guru is prakrtah. One who offends others is naiskrtikah. The jnanis must perform the sattvika tyaga described here, and must take shelter of the knowledge fixed in sattvika karma, must perform sattvika work, and must become a sattvika doer. This is the sannyasa of the jnani. This is my realization on this topic, how I have extracted this meaning of the section. Not only these three items—the knowledge, action (bhakti yoga) and doer (bhakta)-are beyond the gunas, but rather everything related to bhakti is beyond the gunas according to the philosophy of bhakti. 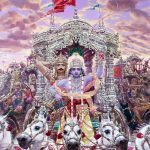 Thus, for the devotees who are beyond the gunas, things related to bhakti such as knowledge, action, faith, residence and the happiness derived from it, are all beyond the gunas. For the jnanls who are in the mode of sattva, things related to jnana are all in the mode of sattva. Everything related to karmis acting in the mode of rajas is rajasic. For the unrestrained person in the mode of tamas, everything related to their action is tamasic. 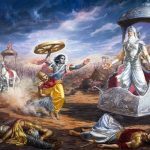 This should be understood by looking over the contents of the Gita. 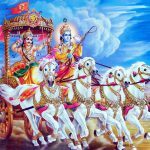 It has also been stated in the fourteenth chapter that even the jnani, at the last stage, after giving up jnana, attains a position beyond the gunas only by the power of pure bhakti, which remains at that point. 18.28 ‘Ayukta’ is the doer who is unqualified for acts enjoined by the Sastras; the meaning is that he is engaged in perverse acts; who is ‘unrefined’, means one uninstructed; who is ‘stubborn’, means one who is not disposed to act; who is ‘depraved’ means one who has the taste for black magic etc; who is dishonest is one who is treacherous; who is ‘indolent’ is one who is not inclined to carry out actions undertaken; who is ‘despondent’ is one given to excessive despondency; and one who is ‘dilatory’, is a person who, while engaged in black magic, etc., pays malevolent attention to produce long-standing evil to others — such a doer is declared to be Tamasika. 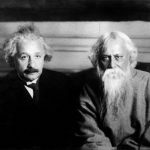 Thus, has been told the threefold division in terms of the Gunas of the knowledge about the work that ought to be performed, and about the agent of work. Now, Sri Krsna describe s the threefold division of Buddhi and Dhrti (fortitude) on the basis of Gunas. These faculties give the determinate knowledge of all realities in existence and of all ends of human life (Purusarthas). The activity that is required to be performed at an auspicious time but is delayed and hence missed the mark also indicates the meaning of dirgha- sutri which includes indolence and incompetence. Although procrastination is accurate it also includes indolence, for even if one is inspired to perform prescribed Vedic activities there is some impediment and obstacles in accomplishing them. This is the result of obscuration of vision and lack of cognizance of the Supreme Lord Krishna’s paramount position. So even one with the potential for great achievements, due to bewilderment, despondency and laziness fails to reap the benefits for not performing the proper activity at the proper time. Such a one is undeniably situated in tama guna the mode of ignorance. 18.28 The agent who is ayuktah, unsteady; prakrtah, naive, of very unrefined intelligence, like a child; stabdhah, unbending like a staff-he does not bend down to anyone; sathah, deceitful, cunning, hiding his own powers; naiskrtikah, wicked, given to destroying the livelihood of others; alasah, lazy, not inclined even to his own duties; visadi, morose, ever in a mood of dejection; and dirghasutri, procrastinating, postponing duties for long, [Ast. adds here, ‘sarvada mandasvabhavah, always slow by nature’.-Tr.] not accomplishing even in a month what is to be done today or tomorrow;-one who is such, he ucyate, is said to be; tamasah, possessed of tamas. 18.26-28 Muktasangah etc. upto Tamasa ucyate. He who does not make speech of egoism : He who does not claim ‘I am the agent’ i.e., he who is different from the one who claims so by natural inclination, or claims as such with an intention that ‘I should do so’, or claims so in an efficient manner. This nini (suffix employed in anahamvadi) does not prohibit for a Yogin, the speech ‘I do’ under the influence of the cover of the mundane life. Who is overpowered by joy and grief : i.e., at the time of success and failure [respectively]. Wickedness : cruelty. ayuktaḥ — not referring to the scriptural injunctions; prākṛtaḥ — materialistic; stabdhaḥ — obstinate; śaṭhaḥ — deceitful; naiṣkṛtikaḥ — expert in insulting others; alasaḥ — lazy; viṣādī — morose; dīrgha-sūtrī — procrastinating; ca — also; kartā — worker; tāmasaḥ — in the mode of ignorance; ucyate — is said to be.